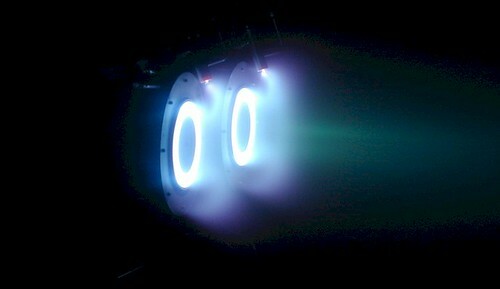 The Air Force Office of Scientific Research is funding Professor Alec D. Gallimore’s research because particle electric propulsion, with its half-inch thruster, increases velocity by several hundred or thousand miles an hour and is expected to have a dramatic impact on nanosatellites and larger spacecraft. These electric fields help to create thrust when the particles are charged, accelerated and propelled into space. "Particles used in this technology are initially 10 to 50 nanometers in size (approximately a thousand times smaller than a human hair in diameter), and we scale them up to between one and ten microns (1/20th to about half the size of a human hair) because at that size, we can see and use them for advanced propulsion research," said Gallimore. Even with the modifications there are still challenges in doing NanoFET research. "There are material science aspects of designing the right materials that can withstand high voltages and close proximity to each other," Gallimore said. "There’s also a challenge of making certain that all materials are in a form that fits on a satellite that’s not much larger than a baseball." Currently the materials are more functional than form-fitting. "We’re hoping that we can actually resolve a lot of these issues in the next three to four years," said Gallimore. In the meantime, the researchers have tested the nanoparticle, electric-based propulsion in air and in a vacuum chamber on an aircraft that replicates conditions of limited gravity. 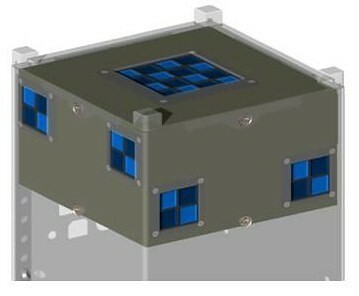 "It has the potential to be a revolutionary propulsion concept, especially regarding nanosatellites and larger satellites, but there’s also a possibility of applying the technology to non-space vehicle applications as well," he said. AFOSR Program Manager, Dr. Mitat Birkan who oversees the research, agrees. "Electrostatic acceleration of charged nanoparticles has many potential applications besides space propulsion, including manufacturing and biomedical technologies." The advantages offered by nanoFET’s potential for high efficiencies, lower thruster specific mass, and longer operational lifetimes are both mission enhancing and enabling. Very cool rocket science, but still a few years off. This entry was posted on Tuesday, October 20th, 2009 at 7:49 am	and is filed under Front Page. You can follow any responses to this entry through the RSS 2.0 feed. You can leave a response, or trackback from your own site. I couldn’t have actually requested an excellent far better blog. You are there to deliver fantastic help, happening until intended for quick comprehension of your own visitor. Youre absolutely a terrific professional on this matter. Kudos considerably pertaining to always becoming there website visitors like us.